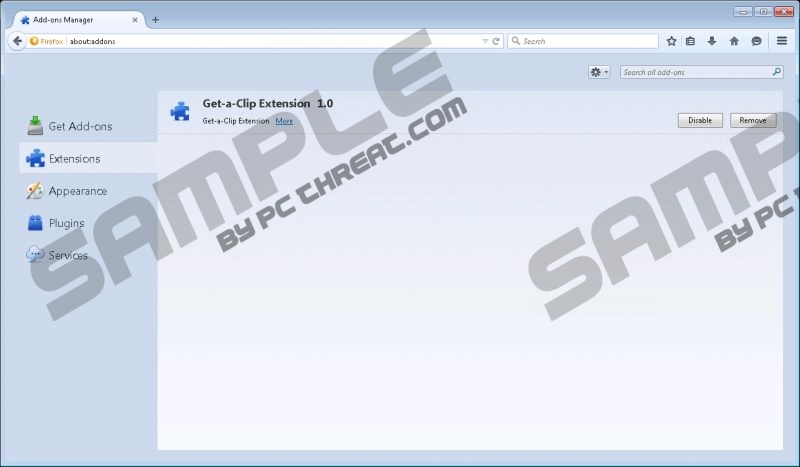 Get-a-Clip is a newly crafted adware application that has been roaming the web lately. Unfortunately, our reports show that quite a few users already have their PC infected with this invasive ad-supported program. This is mostly because users are often tricked into downloading and installing this useless piece of software since vendors of this program employ misleading marketing techniques. On its official website, you can come across statements claiming that this ad-supported program can be used to download videos from YouTube and extract audio in various formats. While it might sound like a program worthy of having, you must know that in reality it will only make your online experience an annoying and frustrating one. Make sure to remove Get-a-Clip as soon as it seen running on your PC as it holds nor beneficial values whatsoever. To do so you should use the detailed removal guide that we provide below. Once Get-a-Clip enters your PC it will implement an invasive third-party browser extension to major web browsers such as Mozilla Firefox, Internet Explorer, Google Chrome. Such broad compatibility signifies that no user can feel entirely safe. Once the adware is up and fully running your web browser will get filled up with unwanted third-party web content, which mostly manifests itself as various commercial ads, coupons, and annoying pop-ups. It goes without saying that such activity promoted by this adware application will ruin your online experience. This is so because at times this intrusive program could flood your web browser with unwanted web content so much that you would have no choice but close down each ad and pop-up just so you could continue browsing the web. It is important to remove Get-a-Clip completely if you wish to regain your web browser’s standard functionality; otherwise, the annoying ads and pop-ups will continue to bother you. In most cases, Get-a-Clip is spread via bundled installers just like other questionable applications of today. To reduce the chances of getting your PC infected in such a way make sure to avoid various third-party hosting websites since they are infamous for being the primary source of installers filled with suspicious software. It goes without saying that you should never skip any steps while installing any program since you could miss an opportunity to cancel the installation of some questionable or even malicious program. Lastly, make sure to implement a reliable antimalware tool if you do not have such a tool already. By running a professional malware detection and removal, your computer will be safeguarded at all times. The removal of Get-a-Clip is not that complicated since you can delete via Control Panel. Once you have performed the manual removal make sure to conduct an in-depth analysis of your PC to be sure that there are no leftover files or registry entries. It is important to remove every single bit of Get-a-Clip since it has been discovered that even a few leftovers could be used to silently restore this ad-supported program. If you think that manual removal and analysis of you operating system is too complicated, make sure to use a licensed antimalware tool for all removal procedures. Click Start and the go to Control Panel. Select Get-a-Clip and then click Uninstall. Quick & tested solution for Get-a-Clip removal.